Along with the String, the array is the most used data structure in Java. In fact, String is also backed by a character array in Java and other programming languages. It's very important for a Java programmer to have good knowledge of array and how to do common things with array e.g. initialization, searching, sorting, printing array in a meaningful way, comparing array, converting an array to String or ArrayList and doing some advanced slicing and dicing operation with an array in Java. Like my previous tutorials 10 examples of HashMap in Java, I'll show you some practical example of array in Java. If you think, any important operation is not included, you can suggest their examples and I'll add them to this list. This is a must-read article for Java beginners but some intermediate Java developer can also benefit from this as it will provide a good overview of an array in Java. 1) Unlike C and C++ array is an object in Java. 2) The length attribute of the array gives the length of an array, this is different from the length() method of String. 3) The length of an array is fixed and cannot be changed once created. The only way to increase or decrease length is to create a new array and copy contents of an old array to a new array. 4) You can access elements of an array using the index, which is non-negative integer value e.g. a will give you second element. 5) Array index starts at zero and ranges till length -1. 6) Unlike C and C++ Java performs bound check while accessing array elements. Trying to access an invalid index in the array will throw java.lang.ArrayIndexOutOfBoundsException. 7) An array is typed in Java, you cannot store Integer in an array of String in Java. It will throw ArrayStoreException at runtime. 8) You can create an array of both primitive and reference types in Java. 9) Array elements are stored in the contiguous memory location, hence creating a big array of JVM may throw java.lang.OutOfMemoryError: Java heap space if that big chunk of memory is not available. 10) The array is the backbone of many useful collection classes in Java e.g. ArrayList and HashMap both are backed by an array. These are some of the important points about Array in Java. If you want to learn more about the array, I suggest you pick a good data structure and algorithm book or course like Data Structures and Algorithms: Deep Dive Using Java on Udemy is a good one to find out more about essential data structure in depth. Similarly, you can declare and initialize a two-dimensional array in Java. There are several ways to do so as I have shown in my articles about how to initialize a two-dimensional array in Java. Read that if you want to learn more about different ways to initialize a 2D array in Java. You can retrieve an element of the array using index e.g. primes will return the first element from prime array, primes will return second element and primes[primes.length - 1] will return the last element from the array. Just remember that index must be a non-negative integer value and starts with zero and ends with length - 1, trying to access an invalid index will throw ArrayIndexOutOfBoundsExcepiton in Java. Btw, if you are a complete beginner on data structure and algorithms then you can also refer a good course on to learn essential data structure like Algorithms and Data Structures - Part 1 and 2 courses on Pluralsight is a nice course to learn algorithms and Fundamental data structure. There are both advantages and disadvantage of each of the approach. You must be careful with end condition while using for loop e.g. a condition <= length is a common cause of java.lang.ArrayIndexOutOfBoundsException, and you don't have to worry about bounds when you use enhanced for loop for iterating over an array. Similarly, when you use enhanced for loop, you don't have access to the current index so you cannot implement an algorithm which requires index like reversing array in place. There are two ways to sort an array in Java e.g. first use the library method Array.sort() which is also the preferred approach or write your own method to sort an array using quicksort or any sorting algorithm of your choice. The Arrays.sort() method allows only increasing order sorting for primitives but both normal and reverse order sorting for object arrays. In order to sort the primitive array in descending order, just sort the array in increasing order and reverse the array in place as shown here. So, use Arrays.toString() method to print one dimensional array and Arrays.deepToString() method to print two or multi-dimensional array in Java. If you are interested to learn more about different types of array, I suggest to check out this Free Data Structure and Algorithm Courses which covers not only an array but other essential data structure as well. What do you think? What should have been the natural way to check if two arrays are equal or not? well, it could have been by using the == operator, but unfortunately, Java doesn't support operator overloading. It doesn't even have the equals() method, so you cannot even do like array.equals(other). So, how do you we check if two arrays are equal or not? Well, you can use Arrays.equals() and Arrays.deepEquals() to check if two arrays are equal or not. Two arrays are said to be equal if they are of the same type, have the same length and have the same element at the corresponding index. Similarly, you can use Arrays.deepToEquals() method to compare two-dimensional arrays in Java as shown in this example here. You can convert an array to String e.g. a comma separated String by writing some utility method as shown below. This method accepts a String array and a delimiter and returns a big String where array elements are separated by a given delimiter. You can use this method to convert a String array to comma separated String, people separated string or colon-separated String in Java. Btw, This is also our 7th example of array in Java. You can see that our String contains all the elements from the array and they are also separated by comma and colon. Btw, If you are preparing for coding interview, then I suggest you join Data Structure and Algorithms - Interview!! course on Udemy, it's a great course to learn about essential data structure and prepare for interviews. Remember, the task is not completed yet as most of the developer will think. We have got a List, not the ArrayList, also the list we have is a read-only list where you cannot add or remove elements but you can replace elements with valid indices. This is the right way to convert an Array to ArrayList in Java. You can see this article to learn more ways to convert an array to ArrayList in Java. 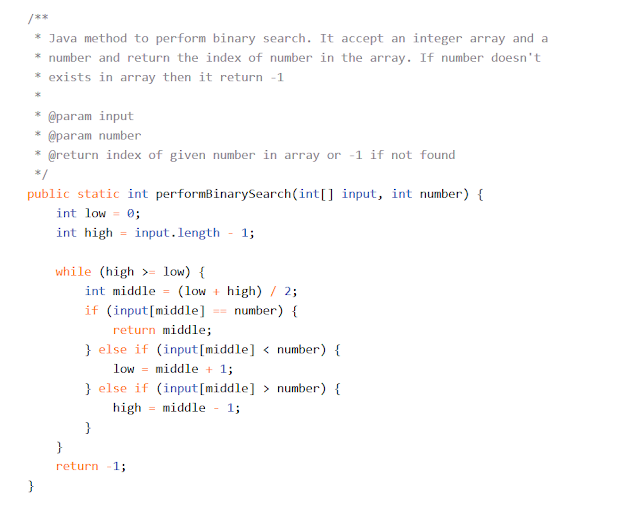 There are two ways to do a binary search in Java either write your own method as shown here or use the Arrays.binarySearch() method, which accepts an array and the element you want to search and return its index if the element is found or -1 otherwise. 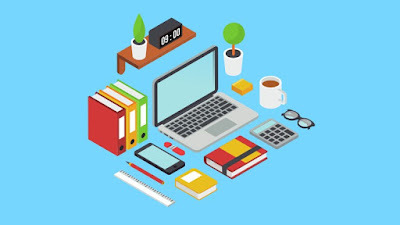 Btw, If you are preparing for coding interview, then I suggest you join Data Structures in Java: An Interview Refresher course on Educative, it's a great course to learn about essential data structure and prepare for interviews. You can use the System.arrayCopy() method to create a subarray from an array in Java. This method is very flexible it allows you to specify start index and how many elements from the start index, this way you can copy any number of elements from an index from the array in Java. You can see we have easily extracted only SBI credit card from the big list of credit card array. Since we specified the source position as 3, System.arrayCopy() started copying elements from the 3rd index or fourth element and then copied it into destination array starting from position zero. The last element is for how many elements to copy, we copied only two because there were only two SBI credit card in the list. That's all about 10 Examples of an array in Java. As I said, the array is the most useful data structure not just in Java but across all programming language. Good knowledge of array and how to do common things with array should be in the fingertips of a Java programmer. If you think, any important array related example is missing here then please suggest and I'll add here.